Colonial house is located in the Old Town, the heart of Quito and only a few steps away to the landmarks and premier sites of the capital. The friendly international volunteers will help you to find the most interesting things to do in Quito and will advise you fun activities such as the Daily Free Walking tour, Teleferico cable car, the famous Iglesia, Basilican and San Francisco churches. -The Twin rooms include two Double Beds. Are you planning to visit other towns in Ecuador? The well-traveled volunteers will be pleased to tell you how to get there by yourself or through an organised tour. They know all about the must-see places to make your trip truly unforgettable. Taxes included, no sudden surprises. I had such a great stay at CH. 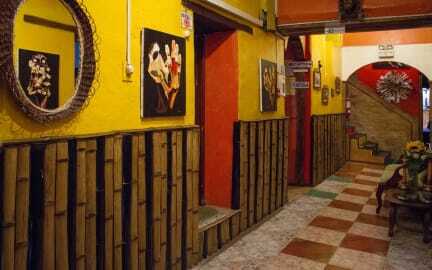 The location is ideal for visiting Quito, and right next to the Mercado Central where I dined four times in three days... The hostel is very quiet and lovely if you’re looking to relax a bit. Not super sociable when I stayed, but there are nice common areas. The staff is great. We forgot our towels and came back for them, and one of them (shoutout Josefina!) personally met us at the bus station with them to save us a trip! Would 100% stay again if I was in Quito! Highly recommend this hostel. Great location in the old town - very walkable to all the top sightseeing spots. I have stayed here each time I returned to Quito because the rooms are clean and comfortable and the staff are wonderful - they make everyone feel so welcome. They go the extra mile to help you out (for example walking me to catch a bus late at night). I do not have one bad thing to say about this place! Great hostel, very quiet with nice atmosphere. Great location. Highly recommend. Great space, very helpful staff, comfortable rooms. Located near good restaurants and good coffee. Loved Colonial house ! AMAZING staff! So friendly & welcoming. Can even organise airport pick up / drop off. More of a quieter hostel, which was great!We stayed here on Christmas and New Years and it definitely felt like a family. Highly recommend staying here.Restaurants/food options close by. Superchill hostel with nice, helpful and friendly staff. They have a nice garden to hang out, socialize and play boardgames. Would definetly recommend it! Staff was amazing, very helpful and nice. The breakfast was awesome!!! Definitely worth 3,50! Location is very close to the historical part of town. The room had a good size. Hot water, as usual in Ecuador, not always available. All in all we had a good time and would definitely come back! Clean, served the purpose, breakfast great. Fairly sterile and nondescript, but good value. No hit water in the shower Still waiting for refund since I left after the firat night without even having a shower. The hostel was not what I expected at all.